On Aug. 17, 1999,  the Earth will be visited by a cosmic voyager - made right here  in the USA. Called the Cassini Space Probe, this is a  rocket-science masterpiece carrying a load of 72 pounds of plutonium  dioxide batteries, on course to skim past the Earth at a speed  of 42,000 miles per hour enroute to Saturn. The probe was launched  in 1997, and is being shot past Venus and the Earth for "gravity  assist boosts" to increase its speed without using additional  fuel. 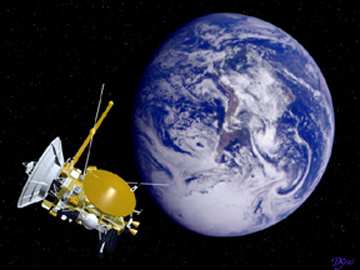 The risk of Cassini's Earth flyby is  the potential that the probe could re-enter the atmosphere, where  it would burn up and distribute plutonium throughout the globe.  Plutonium is extremely toxic, indeed, an instant carcinogen,  and Cassini's 72 pounds of the stuff, evenly distributed, is  enough to give 32 billion people cancer. Cassini is one of about  13 similar nuclar-powered space missions currently in the works.  The question, as we see it, is this: Is this a fair wager  for some additional knowledge of the solar system? The intent of the Cassini Index is to  make available social and scientific views on Cassini, and the  closely related nuclear space program. This is an information  exchange; we welcome your feedback, insights and suggestions. Editorial Policy Statement - we obviously can't take responsibility  for what's on other peoples' web sites. Our selections emphasize  resources which are environmentally-oriented and dedicated to  peaceful ends. Astrologically, we've made no predictions whatsoever  that the Cassini mission will fail, only the statement that it  is dangerous, scary, and that the press may run off with the  story in what we feel are irresponsible ways. We have faith that  the NASA boys can handle their technology, this time around.  But we're very concerned about the idea of plutonium in space,  the nuclear arming of space, and the mindless worship of technology.  Our views are best summarized by Prof. Karl Grossman's Statement at the United  Nations. For  my latest take on the Aug. 11 Total Solar Eclipse, check out  One Way or  Another. Having  said this, happy surfing, and please tell us what you discover. News from  NASA: The exact time of the  Earth flyby has been announced. This is scheduled to occur Aug. 17, 1999 at 8:28 p.m. PDT. Mission control is in Pasadena,  Ca. "I  look out across the slumbering sea of humanity and I whisper  these words in the night. And I know that I address a great being sleeping  still in ignorance of itself. I know that if the wild winter winds of your  communication systems send tatters or fragments of this message  echoing in the darkness, it  will still be to the unconscious that I speak. For the conscious have seen the sky start to  brighten in the east and  have felt the warming spring of eternal life begin to thaw the hardness of their preconceptions."